This weeks bloggers challenge is one of my personal favorites! Same stamp, different point of view. The Purple card uses the Faux Distress Resist Technique, Red card uses the Burnished Embossing Technique - both from the December `07 TJNL. 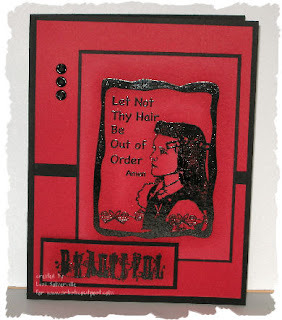 Here's a few more DPOV using the Rustic Artsy Swirl set from Innovative Stamp Creations. 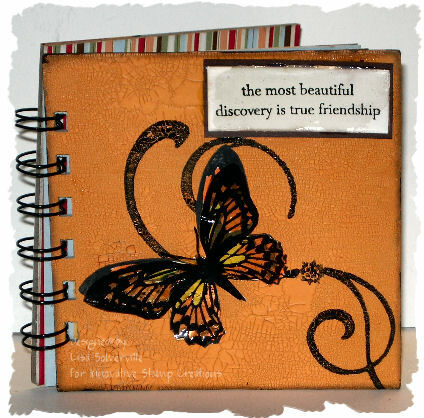 This first piece is a book I made with my BIA, the chipboard is covered with Ranger's Crackle paints, the butterfly is stamped twice, once on card stock, colored and cut out, the second time, it was embossed on Fantasy Film. The second piece is a 3" x 3" gift card set and box that I created a template for. Love the challenge! Great cards/tech's..gotta go tease my hair! LOL...what fun stamps. I've never seen these, but they are a hoot! Wonderful card, with such lovely backgrounds and colors. always amazing! Love both projects. That butterfly stuff you KNOW is rockin! My very favorite. Great projects Lisa! It's amazing how different an image can look depending on how you color (or don't color) it in. Love all 4 of them! Great job with both of your challenge pieces!!!! You always have the most interesting techniques! Great job! Great cards! Love the vivid colors you chose. I'm looking forward to seeing the new TJ newsletter with the techniques you've been showing us! 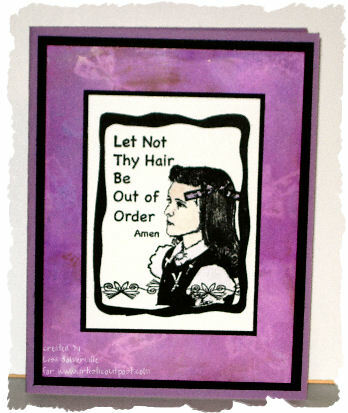 Love what you've done with that "hair" stamp! Not sure I would have looked twice at it on a shelf, but your cards are wonderful. 2nd set is beautiful. All your cards are terrific! Wow, both cards are very different. I'm drawn to the black/red card as it just has a striking look to it. Cleverly done. Oh my gosh, I swear I have a picture of me in the first grade wearing that same hairdo and dress!!! 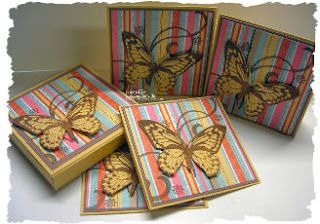 Great cards, love the butterflies!! Great BIA book and mini cards. These are great Lisa. I LOVE the butterfly images. Wow 2 sets of projects. You've been busy! Love the butterfly a LOT! Oooh, so pretty! I just LOVE your butterfly projects!! !